“The media has a social responsibility as it is the primary source of information for people to make their judgement with respect to sovereignty. 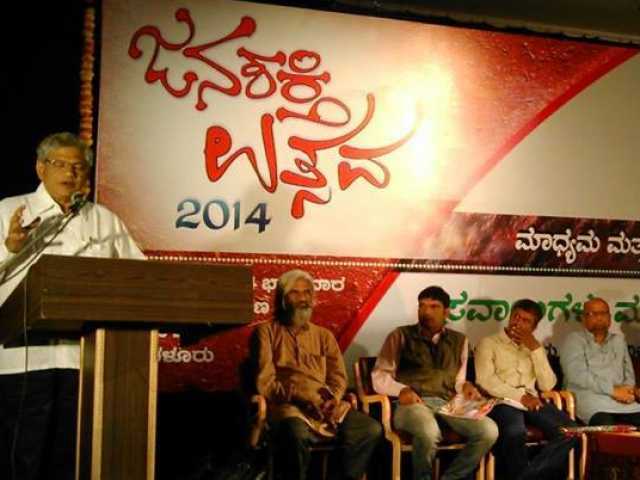 But corporate-controlled media is being used for manufacturing public consent,” said Mr. Yechury inaugurating a seminar on ‘Media and Social responsibility’ organised by Janashakti (Kannada weekly magazine) as part of ‘Janashakti Festival 2014’. He also released Janashakti Independence Day Special. Twelve outstanding people - who have contributed to the weekly as writers, reporters, circulation and management – were also felicitated at the day-long event. Referring to attempts at evolving a regulatory mechanism for the media by TRAI, Press Council, I&B Ministry etc., Yechury said it is better for the media to evolve a self-regulation mechanism. He also questioned equating corporates and political parties, in the background of TRAI recommending barring both from owning media. In today’s context where media has failed to discharge its responsibility, he said importance of media like Janashakti increases manifold. He called upon party to strengthen Janashakti and expand its activities in the media including the social media to reach out to people. Veteran progressive Journalist and presently media adviser to the Chief Minister, Dinesh Aminmattubegan said that uttering the word Janashakti (People’s Power) “gives me a thrill because it was part of the by-line of the daily Mungaru in which I began career as journalist”. He exposed the corrupt practices indulged in by media owners as well as journalists in the recent elections, with some examples from Karnataka. He called for extending the Lokpal Act to journalists and also urged Justice Katju to act on report given to Press Council regarding paid news. If that was done, he predicted many editors and senior journalist will go to jail. This comment of his created storm in media circles next day, with many media bigwigs calling him ‘irresponsible’. N.A.M. Ismail, senior Journalist asserted that given today’s media situation, the only way to imposing social responsibility on media is by readers and progressive movements asserting their right by writing in columns open to readers and exposing any wrong-doings using variety of methods ranging from pamphleteering to social media. CP(M) State Secretariat member G N Nagaraj spoke on the impact, importance and possibilities of social media. He called upon the Left progressive movements to disseminate news, views, initiate and intervene in discussions/debates, and use it to reach out to people. He also warned that though social media seems to be ‘free’ from control of corporates and government, it is very much controlled by few US companies and hence by international finance capital. Naveen Soorinje, well-known young TV journalist who was jailed for exposing moral police attack at Mangalore Homestay, called left and progressive movements to intervene in the media in an organised way. Response to the ‘Janashakti Festival’ held first time in this format was very encouraging. The hall in which it was held was overflowing with people. It also included songs on communal harmony and anti-caste folk song performances. It included a session of delegates from all districts who are part of larger ‘Janashakti Community’ contributing as Writers, Reporters, Sales Agents. The session discussed two reports that presented current achievements/shortcomings and plan for improving content and circulation of Janashakti (including its web version). The Session set itself a target of trebling the circulation of paper in next 6 months. It also resolved to make ‘Janashakti Festival’ an annual gathering.